Google Translate in Medicine from Graham Walker on Vimeo. SOTU - Where's Health Care? The prepared text of the President's State of the Union message has bare mention of health care. See if you can find it in this wordle cloud from quorum.com. "Now, I’ve heard rumors that a few of you have some concerns about the new health care law. So let me be the first to say that anything can be improved. If you have ideas about how to improve this law by making care better or more affordable, I am eager to work with you. We can start right now by correcting a flaw in the legislation that has placed an unnecessary bookkeeping burden on small businesses. More broadband access means patients will be able to have face-to-face video chats with their doctors. Veterans can now download their electronic medical records with a click of the mouse." Please join members of the Nationwide Health Information Network technical team for a special information session on implementing Nationwide Health Information Network specifications. This orientation will bring together technical consultants, entities that have implemented the specifications, and organizations just starting the process of implementation in an informative exchange of best practices and a robust question and answer session. The health care reform debate hits a new low as Democrats insist that Republicans refer to health care reform as job-destroying, not job-killing. "Repeal, replace, renew, revise, revisit - what the bloggers say" at Managed Care Matters highlights the very best of the medical policy blogosphere. Paduda graciously acknowledges that I am not an economist - - perhaps the best compliment so far of 2011! The long awaited report from Harvard Professor William Hsiao and team recommends a public/private single payer system as the most cost effective for health care delivery in the state over the next 15 years. With the governor and legislature lined up to support this recommendation, it requires a federal government waiver and implementation time for this single payer experiment to get underway in a state laboratory. For more on the background, see Single Payer System Takes Center Stage in Vermont. On January 12, the Health Information Technology Policy Committee published its proposed Stage 2 and 3 Meaningful Use recommendations for public comment. Robin Raiford from Allscripts created a Quick Guide to the recommendations, making it easy to compare Stage 1, 2 and 3 in a single PDF. Here's my analysis of the proposed Stage 2 and 3 criteria. 1. CPOE - Stage 1 requires more than 30% of unique patients with at least one medication in their medication list have at least one medication order entered using CPOE Stage 2 expands this to 60% of patients for at least one medication, lab or radiology order. Stage 3 expands this further to 80%. CPOE orders do not need to be transmitted electronically to pharmacies/labs/radiology departments. This is a very reasonable rate of CPOE adoption. The hardest part of implementing CPOE is getting started, which happens in Stage 1. Adding different types of transactions (without requiring electronic transmission to back end service providers) is more about workflow and behavioral change than technology change. 2. Drug-drug/drug-allergy interaction checks - Stage 1 requires that interaction technology be enabled. Stage 2 adds that it will be used for high yield alerts, with metrics for use to be defined. The idea is that many drug databases contain too many false positive interaction rules, so adoption is slowed by alert fatigue. If only high yield alerts are required (here's what we've done at BIDMC ), clinicians are more likely to trust drug interaction decision support. Stage 3 adds drug/age checking (such as geriatric and pediatric decision support), drug dose checking, chemotherapy dosing, drug/lab checking, and drug/condition checking. These are all reasonable goals, but automating chemotherapy protocols is quite challenging. BIDMC built anOncology Management System and added a full time research nurse to ensure all chemotherapy protocols are updated and accurate. It may be asking too much to require chemotherapy dosing decision support nationwide by 2015. 3. e-Prescribing - Stage 1 requires e-prescribing of 40% of non-controlled substances. Stage 2 expands this to 50%. Stage 3 expands it further to 80%. Electronic faxing is permitted if pharmacies cannot accept e-prescriptions. These are very reasonable goals and easily achievable if e-prescribing systems are in place, which is required for Stage 1. E-prescribing of controlled substances, which requires more effort including two-factor authentication, is not specifically mentioned. 4. Demographics - Stage 1 requires capture race/ethnicity, primary language, and other demographics for 50% of patients. Stage 2 expands this to 80%. Stage 3 expands this further to 90%. Most institutions are already near 100% since they capture this information as part of existing registration and billing processes. 5. Report quality measures electronically - Stage 2 and 3 will be specified by the Quality Measures Workgroup and CMS. No further detail is offered at this time. The hardest part of quality measure reporting is computing the numerators and denominators as is required for Stage 1. Generating the PQRI XML to send the data to CMS is quite easy. 6. Maintain problem lists - Stage 1 requires documentation of at least one problem for 80% of patients. Stage 2 is unchanged. Stage 3 requires that problem lists be up to date. This is reasonable. Clinicians will be motivated to update them because the problem list will be included in clinical summaries sent to the patient after every visit. I hope that EHR vendors improve the usability of problem list management functions by creating natural language translation into the required SNOMED-CT or ICD9/ICD10 vocabularies. 7. Maintain active medication lists - Stage 1 requires documentation of at least one medication for 80% of patients. Stage 2 is unchanged. Stage 3 requires that medication lists be up to date as part of medication reconciliation, which per requirement 31 below will be a core requirement with 80% compliance in Stage 2 and 90% in stage 3. In my view, the greatest strength of EHRs should be medication management. 8. Maintain active medication allergy lists - Stage 1 requires documentation of at least one allergy for 80% of patients. Stage 2 is unchanged. Stage 3 requires that allergy lists be up to date. Clinicians will be motivated to update them because the allergy list will be included in clinical summaries sent to the patient after every visit. 9. Vital signs - Stage 1 requires vital sign recording for 50% of patients. Stage 2 expands this to 80%. Stage 3 is the same as Stage 2. This is reasonable. 10. Smoking status - Stage 1 requires smoking status documentation for 50% of patients. Stage 2 expands this to 80%. Stage 3 expands it to 90%. This is reasonable. 11. Use Clinical Decision Support to improve performance on high-priority health conditions - Implemented properly, decision support can save time while enhancing safety. Maintaining rules can be challenging and I hope companies evolve to provide cloud-based approaches to decision support. 12. Formulary checks - In Stage 1, formulary checks are in the menu set with the requirement that clinicians and hospitals have access to at least one internal or external drug formulary for the entire EHR reporting period. Stage 2 moves this to core. Stage 3 requires the functionality to be applied to 80% of medication orders. Formulary checking is generally a part of e-prescribing, so this is reasonable. The only unknown is how formularies vary in different regions. Since Massachusetts has only 3 major payers, all regional, formularies have been relatively easy to manage. 13. Advanced directives - In Stage 1, Advanced Directives are in the menu set with the requirement that 50% of patients 65 and older have advance directive documentation. Stage 2 moves this to core. Stage 3 requires 90%. I believe this is a laudable but a challenging goal to achieve. My experience is that most hospitals have advanced directives recorded for less than 25% of their patients. 14. Incorporate lab results as structured data - The Stage 1 menu set requirement is that lab results are incorporated into EHRs as structured data for more than 40% of all clinical lab tests ordered. Stage 2 moves this to core. Stage 3 expands the functionality for 90% of tests ordered and requires they be reconciled with structured orders. Lab workflow improvement is one of the best ways to save clinicians time and ensure followup of abnormal results. My only reservation with this requirement is that the standards for content and vocabulary (lab compendiums) are still a work in process, so reconciliation with electronic orders may be premature. 15. Generate patient lists - The Stage 1 menu set requirement is to generate at least one report listing patients with a specific condition. Stage 2 moves this to core. Stage 3 requires such lists are used to manage patients for high priority health conditions. EHRs must include business intelligence capabilities as part of Stage 1 certification, so these recommendations should be easily achievable. 16. Send patient reminders - The Stage 1 menu set requirement is to send reminders to more than 20% of all unique patients 65 years/older or 5 years old/younger. Stage 2 makes this core. Stage 3 requires 20% of all active patients who prefer to receive reminders electronically receive them. I'm supportive of this requirement if I can fulfill it by offering all our patients secure web-based reminders via our PHR. Offering multiple electronic notification options (phone, fax, secure email, PHR, Facebook, Twitter, SMS texting) would be hard to manage. 17. Electronic outpatient notes - Stage 2 adds a new requirement for eligible professionals that 30% of visits have an electronic note. Stage 3 requires 90%. This note can be scanned, free text, structured etc. Offering the option of scanning, dictating, structured and unstructured makes this requirement very reasonable. 18. Electronic inpatient notes - Stage 2 adds a new requirement that 30% of hospital days have at least one electronic note by a physician, NP or PA. As with outpatient notes, this can be scanned, free text, structured etc. Very few hospitals have electronic inpatient documentation. Offering the option of scanning paper notes makes this requirement very reasonable. 19. Electronic Medication Administration Records - Stage 2 adds a new requirement that 30% of medication orders are tracked via an EMAR. Stage 3 makes this 80%. The definition of EMAR will be key. I think of an electronic medication administration record as positive patient identification of every patient, every drug and every staff member with mobile devices to record all medication events in real time. Requiring this for the entire country by 2015 is aggressive. 20. Provide an electronic copy of health information - Stage 1 requires this for 50% of patients who request it. Stage 2 is unchanged. Stage 3 requires 90%. The challenge is implementing the workflow to support this requirement, which has to be done for Stage 1. Thus Stage 2 and 3 are reasonable. 21. Provide a copy of discharge instructions - Stage 1 requires this for 50% of patients who request it. Stage 2 expands this to 80%. Stage 3 expands it to 90%. Since printed discharge instructions meet the criteria, this is reasonable. 22. Patient specific educational resources - Stage 1 requires this for 10% of patients. Stage 2 is unchanged. Stage 3 expands this to 20% in common specific languages. This key question is what is a common language? BIDMC supports 37 different languages. Offering educational resources in all these languages would be challenging. 23. Web-based download of inpatient records - Stage 2 adds the ability to view and download inpatient summaries for 80% of patients. Stage 3 is the same. Since BIDMC already has a PHR offered to all its patients, this requirement is actually an easier workflow than providing inpatient record summaries upon demand via a manual process. This requirement will be challenging for organizations which have not yet widely implemented personal health records. 24. Provide clinical summaries for each office visit - Stage 1 requires this for 50% of all patients (not just those who ask). Stage 2 expands this to "view and download" within 24 hours. Stage 3 is the same. The challenge is that records may not be completed and signed within 24 hours, especially if dictation or scanning processes are used to generate the electronic record. 25. Timely electronic access - The Stage 1 menu set requirement is that more than 10% of all unique patients seen by the clinician are provided timely electronic access to their health information subject to the clinician's discretion to withhold certain information. Stage 2 and 3 make this core and include the requirement that patients should be able to filter or organize information by date, encounter, etc. More detail is need about the requirement to organize the data to determine just how difficult this will be. This requirement will be challenging for practices which have not widely implemented personal health records. 26. Measures for clinical summaries and timely electronic access - Stage 2 requires that 20% of patients use a web-based portal and Stage 3 expands this to 30%. It seems a bit odd to measure clinician performance based on patient behavior. BIDMC has offered comprehensive secure email, timely access to all inpatient/outpatient data, and even full text notes. After 10 years, no more than 20% of our patients use these functions. I think a better approach is to require such functions be offered to all patients criteria is that all patients. Adoption is something beyond clinician control. 27. Online Secure messaging - Stage 2 and 3 adds a new requirement that online secure messaging be in use. Our experience with online secure messaging is that it reduces clinician time returning phone calls and enhances both clinician and patient satisfaction. This is a reasonable requirement. 28. Patient preference for communication medium - Stage 2 adds a new requirement that patient preference for communication be recorded for 20% of patients. Stage 3 expands this to 80%. Per my comment in Timely Electronic Access, I would prefer offering all patients web-based communications rather than trying to manage multiple communication approaches. 29. Patient Engagement - Stage 3 includes multiple new patient engagement requirements - electronic self management tools, EHR interfaces to PHRs, patient reporting of care experiences online, and patient generated data incorporation into EHRs. These need to be defined in much greater detail before their implications can be assessed. 30. Perform test of HIE - Stage 1 required one test. Stage 2 expands this to at least three external providers in primary referral networks (but outside the delivery system that uses the same EHR) or a bidirectional connection to at least one health information exchange. Stage 3 expands this to 30% of external providers or a connection to a health information exchange. Stage 2 and 3 require the HIE to connect to an entity-level provider directory. Although some regions with well developed HIE capabilities will find this easy to achieve, many will await the functionality promised by the Direct Project in order to exchange data. 31. Perform Medication reconciliation - The Stage 1 menu set requirement is medication reconciliation in 50% of care transitions. Stage 2 moves this to core and expands it to 80%. Stage 3 expands this to 90%. Since the Joint Commission required this over 3 years ago, it is very reasonable. Hard to operationalize, but the right thing to do. 32. Provide summary of care record - The Stage 1 menu set requirement is a summary of care record for more than 50% of transitions of care and referrals. Stage 2 makes this core. Stage 3 expands this to 80%. The challenge will be defining how this content is transmitted from provider to provider. 33. List Care members - Stage 2 adds a requirement to provide a list of care team members (including PCP) for 10% of patients. Stage 3 moves this to 50% via electronic exchange. Once more details about the electronic exchange are provided, I can better assess this requirement. 34. Longitudinal care plan - Stage 2 adds a requirement to record a longitudinal care plan for 20% of patients with high-priority health conditions. Stage 3 expands this to 50%. Although I'm familiar with pilots in which clinicians and patients jointly develop care plans, I have not seen it widely implemented. This may be a bit aggressive. 35. Submit immunization data - The Stage 1 menu set requirement was a single transaction. Stage 2 moves this to core and requires ongoing submission. Stage 3 requires query and review of immunization registry data. The challenge is that many state and local public health departments do not offer the ability to receive and query immunization data. 36. Submit reportable lab data - The Stage 1 menu set requirement was a single transaction. Stage 2 moves this to core. Stage 3 includes the requirement for hospitals to include complete patient contact information in 30% of reports. As with immunizations, state and local public health departments may find this challenging to support. 37. Submit syndromic surveillance data - The Stage 1 menu set requirement was a single transaction. Stage 2 moves this to core. Stage 3 includes patient self report and something called the Public Health button, which is not defined. Public Health Departments may find this challenging to support. 38. Ensure privacy - Nothing new was specified but additional privacy and security objectives are under consideration by the HIT Policy Committee’s Privacy and Security Tiger Team. Thus my areas of concern are chemotherapy automation, recording patient communication preferences, judging clinician performance based on patient adoption of PHRs, EMAR implementation, maturity of HIE capabilities, widespread rollout of longitudinal care planning, and public health readiness. It's great to have a roadmap so we know where we're going between now and 2015. At present BIDMC is completing its certification inspection tests and is working hard to achieve meaningful use by the end of March so we can attest in April. Given the challenges of achieving certification and meaningful use for Stage 1, we welcome a two year window to prepare for Stage 2. An increasing number of office-based physician practices report having an electronic health record, according to a recent survey. Survey respondents also reported high levels of interest in adopting electronic health records and health information technology. The survey [PDF - 220 KB] was conducted by the National Center for Health Statistics (NCHS), an agency of the HHS’ Centers for Disease Control and Prevention. More and more physicians are putting a private and secure electronic framework in place to realize long-term improvements in quality of care, efficiency, and health costs. But the presence of an EHR does not make a physician a meaningful user. An electronic health record, as defined in the survey, could have been just a “basic” EHR—one that stores patient demographic information, patient problem lists, clinical notes, laboratory and imaging results, and orders for prescriptions. Basic EHRs are not capable of being used to meet the requirements of meaningful use. Fortunately, additional data commissioned by the Office of the National Coordinator for Health Information Technology (ONC) and carried out in the course of regular annual surveillance by the NCHS and by the American Hospital Association (AHA) provide further encouragement that EHR adoption is about to pick up speed. The NCHS survey found that 41 percent of office-based physicians are currently planning to achieve meaningful use of EHRs and apply for incentive payments. Four-fifths of these, or about a third of all office-based physicians (32.4 percent), plan to apply this year. The AHA survey found that 81 percent of acute care non-federal hospitals plan to achieve meaningful use of EHRs and apply for incentive payments. About two-thirds of hospitals (65 percent) plan to enroll during Stage 1 of the Incentive Programs, in 2011-2012. At ONC we are gratified that such sizeable percentages of physicians and hospitals intend to take the plunge—and to take the plunge sooner rather than later. Acting early (in Stage 1) means obtaining maximum funding through the Medicare and Medicaid EHR Incentive Programs. Physicians and other eligible professionals can qualify for incentive payments totaling as much as $44,000 through Medicare or $63,750 through Medicaid. Hospitals can qualify for millions of dollars of incentive payments for implementing and becoming meaningful users of EHR technology. The registration process is now open for health care providers to obtain significant incentive payments for the adoption and meaningful use of certified EHRs. We recognize that EHR adoption and meaningful use are hard work and a big investment, especially for small primary care practices, where the vast majority of physicians work and where most of patient care is coordinated and documented. Many of these providers still need to learn about the opportunity they have. Now is the time. Unprecedented resources, including the EHR incentive and technical assistance programs created under HITECH, are available. Sixty-two Regional Extension Centers (RECs) across the nation are prepared to offer customized, on-the-ground assistance. And the Health IT Workforce Development Program is training talented professionals to help providers implement and manage their health IT systems. Moreover, medical and hospital professional organizations are lighting the way. Rest assured there are also regulations in place to make sure that information stored in an EHR is protected. The same Health Insurance Portability and Accountability Act (HIPAA) privacy and security protections that apply to paper records also apply to EHRs. Never again will the same level of resources and talent be devoted to helping providers make the switch to health IT. The incipient surge in EHR adoption is galvanizing, especially for those of us who are committed to making the transition from paper-based medical records to EHRs as seamless and as successful as possible for every provider. ONC will continue to offer encouragement and support. For more information on the Medicare and Medicaid EHR Incentive Programs, visit http://www.cms.gov/EHRIncentivePrograms. Providers can also find REC contact information at http://healthit.hhs.gov/rec. Learn about the HIPAA Privacy and Security Rules by visiting http://www.hhs.gov/ocr/privacy/. 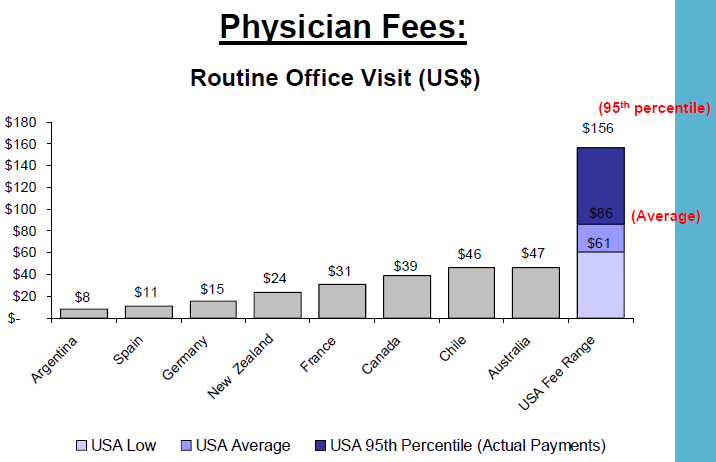 The US, ranked just higher than Slovenia in performance among world health systems, has consistently higher prices than any other country surveyed by the International Federation of Health Plans. The report consists of 23 pricing measures and the pattern is the same across the board. 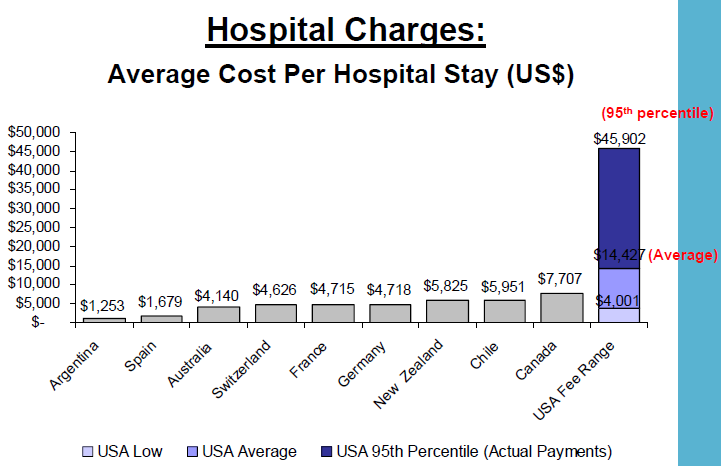 As examples, the full report shows "total hospital and physician costs for delivering a baby are $2,147 in Germany, $2,667 in Canada, and an average of $8,435 in the United States. The survey shows that the cost for a hospital stay is $1,679 in Spain, $7,707 in Canada, but these costs can range from an average of $14,427 to $45,902 in the United States. The survey also found that the cost of a widely prescribed drug like Nexium can range from $30 in the United Kingdom to $186, the average cost in the United States." A new workgroup, formed under the auspices of the HIT Policy Committee and the HIT Standards Committee is beginning its work to help ONC analyze public comments on the President’s Council of Advisors on Science and Technology (PCAST) report, discuss the implications of the report on current ONC strategies, assess the feasibility and impact of the PCAST report on ONC programs, and elaborate on how these recommendations could be integrated into the ONC strategic framework. To advise ONC about the report's recommendations, workgroup members need to understand terms such XML, RDF, JSON and Metadata as well as learn about the standards efforts to date to create human readable and computable data elements for healthcare. For the complete post, link to http://geekdoctor.blogspot.com/2011/01/primer-on-xml-rdf-json-and-metadata.htm. Surgery, checklists and Van Halen are among the interview topics. For more information, see HTN's article on Checklists. Check out the latest Health Wonk Review - the best of the healthcare policy blogosphere - hosted by Avik Roy at The Apothecary. There are some terrific posts on the individual mandate, the role of states, economics and costs. A Healthcare Technology News article is also featured. Top Organizational #HITsm Contributors: @HITNewsTweet, @HITpol, @ONC_HealthIT, @HITExchange, @CareCloud, @HL7, @HSPH_CCPE, @HIMSS, @CMIOmagazine and @HealthImaging. The Office of the National Coordinator for Health Information Technology (ONC) issued a final rule to establish the permanent certification program for health information technology. The permanent certification program provides new features that will enhance the certification of health information technology, including increasing the comprehensiveness, transparency, reliability, and efficiency of the current processes used for the certification of electronic health record (EHR) technology. Meaningful use of “Certified EHR Technology” is a core requirement for eligible health care providers who seek to qualify to receive incentive payments under the Medicare and Medicaid Electronic Health Record Incentive Programs as authorized by the Health Information Technology for Economic and Clinical Health (HITECH) Act. The temporary certification program, established through a final rule published on June 24, 2010, will continue to be in effect until it sunsets on December 31, 2011, or at a later date when the processes necessary for the permanent certification program to operate are completed. ONC expects to stand-up the programmatic activities necessary to implement the permanent certification program throughout 2011. As proposed, ONC will request that the National Institute of Standards and Technology (NIST) through its National Voluntary Laboratory Accreditation Program (NVLAP) develop a laboratory accreditation program for organizations to be accredited to test health information technology for purposes of the permanent certification program. Based on NIST’s technical expertise and the strong relationship formed between ONC and NIST during the successful implementation of the temporary certification program, the use of NVLAP is expected to enhance testing under the permanent certification program and its objectivity overall. This final rule is issued under the authority provided to the National Coordinator for Health Information Technology in section 3001(c)(5) of the Public Health Service Act, as added by the Health Information Technology for Economic and Clinical Health Act. For more information about the permanent certification program and the final rule, please visit http://healthit.hhs.gov/certification. Will HITECH exacerbate differences in quality and outcomes? In an open letter to the vendor community National Coordinator for Health IT Dr. David Blumenthal appealed for assistance in overcoming the digital divide, asking health IT vendors to "include providers who serve minority communities in their sales and marketing efforts". "It is absolutely necessary that the leading EHR vendors work together, continuing to provide EHR adoption opportunities for physicians and other healthcare providers working within underserved communities of color. Despite our best efforts, data from the National Ambulatory Medical Care Survey indicates that EHR adoption rates remain lower among providers serving Hispanic or Latino patients who are uninsured or relied upon Medicaid. Moreover, this data also identifies that EHR adoption rates among providers of uninsured non-Hispanic Black patients are lower than for providers of privately insured non-Hispanic White patients." Blumenthal's letter goes on to acknowledge the critical roles played by the administration and REC's in addition to the IT vendors to "work together and focus substantial efforts on these priority populations." Properly applied, electronic health records will raise the quality of care and outcomes wherever they are deployed. However, will EHR's, unequally deployed, heighten the appalling differences in care quality and outcomes that exist today among races and regions in the U.S.? To address this question, its helpful to understand these baseline differences. The Dartmouth Atlas Project has released its Primary Care Report, examining disparities in health care quality and outcomes. "Blacks had much higher rates of leg amputation, a grave consequence of poorly controlled diabetes and peripheral vascular disease. Amputation rates were 4.7 times greater in blacks than in whites nationally during the study period from 2003 to 2007. Among U.S. hospital referral regions (HRRs), rates of amputation for all Medicare beneficiaries differed by a factor of 10, an extraordinary degree. In a closer look at the 44 hospital service areas (HSAs) within a single HRR, Atlanta, Georgia, there was almost a fourfold variation in leg amputation rates." For evidence-based, recommended services, such as appropriate testing for diabetes and mammography, variations across the nation’s HRRs were substantially greater than the disparities by race within a given region. We found similar results across the smaller HSAs, and we demonstrate this with data from the HSAs within the Atlanta, Georgia HRR. In other words, where patients live has a greater influence on the care they receive than the color of their skin. Indeed, in a few locations, blacks received equal or better care than did whites, but care for all patients was less than ideal." To address these disparities, The Dartmouth Atlas Project properly highlighted the need for focus on the "full spectrum of health determinants, ranging from lower levels of schooling and limited health literacy, to inadequate housing and lack of transportation, as well as lack of access to high-quality primary care that is well-coordinated with specialty care." Meaningful use will raise the level of provider capability to proactively manage the health of patient populations. There's the real possibility that Stage 1 Meaningful Use can uplift the level of care and outcomes for millions, giving providers systematic visibility to quality measures that matter for better managing chronic conditions that drive 75% of the national health care costs. This can, over time reduce the number of amputations as an example. Perhaps it will be Health Information Technology combined with health-care-reform-fueled accountable care organizations that will finally overcome some of the intractable problems of care coordination that Dartmouth Atlas suggests may be behind these stats. Even as HITECH raises the potential for better health outcomes nationally, might it also cause increasing disparities at the same time? There are signs that smaller physicians are now starting to invest in EHR's in larger numbers. This will be a great equalizer to be sure, as primary care practices are enabled with the tools that heretofore have been thought to be beyond the reach of most small practices. Other equalizers include the special incentives for rural providers and federally qualified health centers. David Blumenthal's efforts to focus all parties on underserved populations should be lauded and supported. There is reason for concern. Meaningful use is incentive-based and voluntary. So while meaningful use will raise the levels where it's applied, might that investment occur unequally? Might the regions that are already achieving better health outcomes be the ones most likely to become meaningful users of EHR's? Will supplemental hospital (Stark relaxation) incentives be unequally and similarly applied by area? Might this actually exacerbate the differences in care and outcomes across regions and races?